Hi Kasun. Congratulations for your work! I belong to the Learning Technologies of the Open University of Catalonia (Barcelona, Spain) and we work in projects also related with DocBook, like translatord to epub and mobipocket and so on. If you are﻿ interested in any international collaboration, please,﻿ contact us at jrivera@uoc.edu. Excellent, excellent! I've been thinking of something like this for years, and now you've done it! In this manner the list of the founded words will be sorted by the scoring. 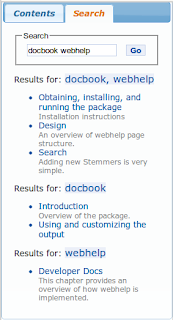 thanks for your interest in docbook webhelp project. Currently, only smartness it have is the stemming support and international language support. I suppose you know what I meant by this. BTW, I heard that oXygen editor is implementing a search with scoring. If there's a chance to use it (no licensing issues!) and compatible with ours, we'll include it to webhelp. Are you aware of a project that could allow to edit docbook via a web interface ? Because there are many export formats, but very few editors for Docbook. Thanks for creating this nice DocBook output! This is great. I've been trying it out. * Search: Can it limit search result to a specific multi-word search like "Java 1.6"? * Handling Includes and Entities with Saxon: My XML files use includes and entities. I can generate the files from the command line using Saxon, etc. as shown here: http://www.sagehill.net/docbookxsl/Xinclude.html. However, I'm wondering if you know of an easy way to modify the build.xml to handle these. Not sure if you can use Ant's xslt or java tags for this purpose. I've been playing around with docbook and webhelp. I've the problem if I click at the left navigation tree sometimes the #content runs way to far. That means the jump to the anchor doesn't work proper. Sometimes #content scrolls to much... Do you have an fix for that? It's commented, so you won't be able to miss it. And, now we have word scoring for search. So, for the title / a bold word etc. will get a higher rank. The relevance is shown in for each search result using a 1-5 scale graphically. It seems to work great! Contributed by Oxygen guys. tinti has asked about this a while ago, guess others will find this useful. We are rolling out a new Docbook release soon. So... stay tuned! 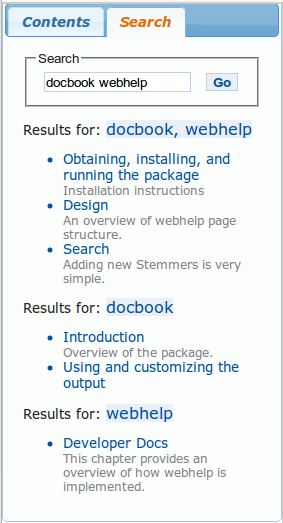 We have implemented your stemmers in our DocBook environment in a custom web-based help solution. We seem to be having a little trouble, though, with some of the terms that are returned by the tokenizer (always returning alwai, array returning arrai, using returning us, and similar problems). Can you point me to any current work that might resolve some of these issues? Those tokens you mentioned are quite normal cases. That's because stemming does NOT produce English words always; and it doesn't need to. It only produces a word that could be considered as the root-word. But this isn't supposed to be a problem, because the client-side stemmer stems the words in the user queries as well. If you are still interested in having the real words in the index, you may start by looking at the given link. Currently, there isn't any plan to implement this in to docbook webhelp because current implementation is more than sufficient. What's rationale to have the said functionality of yours? Well, the problem is that in some cases, the search is missing important terms. I work with an organization that produces servers, so not bbeing able to search on the term "array" is a problem. Some of the issues with gerunds and other fixed word categories aren't such a problem. However, we would just like to minimize the cases in which endings are arbitrarily removed. I don't see how -ay wound up on the list of postpositional morphemes to be removed. I can't think of any context in which it's used as an internal morphemic change. So the removal of this particular morpheme bugs me.... and makes me a little wary of other possible gotchas. Overall, I'm happy with the performance. It was a great feature to add to DocBook XSL. Thanks. The issue in here is in the Java English stemmer, which apparently does not implement the specified algorithm correctly there. It seems to me that the Tartarus Snowball generated code (which we use from http://snowball.tartarus.org/download.php) is a little different from the dedicated English Stemmer (in the first link). We better reach the upstream snowball project and use the most correct one. Thanks, Kasun. That helps a lot. Great! :) I'll see what I can do from my end. Thank for your work, Kasun. It's superb! David has just committed support for xinclude to the build.xml that's in svn. You could have give it a try using DocBook snapshots, but currently it's broken. A new release of DocBook-XSL (including webhelp) will come anytime now. So, you may use it for your production purposes when it's available. You could also just use Docbkx since xinclude is supported there too. work too by stripping the namespace first. This answer was compiled with the help of David Cramer. I have posted my problem in the Oxygen Forum (http://www.oxygenxml.com/forum/topic6528.html) and they noted that my book had no title. After including a title, everything went smooth. By the way, I suppose that Oxygen is using your latest converter. Do you have any contact with them? Good to hear that your issue is now fixed. Hope your experience with webhelp will go smooth. Oxygen is using the latest _released_ version of webhelp XSLs. That means the development on trunk is not there. I will write another blog post when the current trunk get released (with new snapshots!). We are in contact with Oxygen where we worked with them for integrating this to OxygenXML. What do you have in mind? Please share us your experience with webhelp as well when you are ready. It'll help us improve! We are trying to write the help of an academic software. We have investigated several formats and it seems that webhelp is the more suitable by now. I will let you know the project webpage as soon as it becomes available. That'll be great. Keep an eye on docbook-apps mailing list for the release of new version as well. I'm new to DocBook and WebHelp, and I would like to know if it is possible to use DocBook+WebHelp to easily set up a "context-sensitive" help system for a web application using your contribution to the project. "Cross platform, web-based WebHelp from DocBook" for contextual help, and much more. Perhaps you could clarify something for me -- looking at the webhelp docs on sourceforge, it appears that to replace the jqueryui theme and/or positioning.css that I'll need to copy webhelp.xsl and make the changes in that . Then I'll need to point to that new webhelp, as opposed to just setting a parameter somewhere. Is that correct? I just saw your comment. Somehow I missed it before. Sorry for the late reply. Currently, that is the case. We will parameterize the jquery themes. You may just edit the current positioning.css file if it's ok with you. Since webhelp is already a highly customized output, this need arises sometimes. I'm converting all the docs for the Phing project (http://www.phing.info/trac/) and I was wondering about one thing. We have a fairly long index and when you tap a title and the corresponding page is loaded in the right frame all the toc stuff in the left frame is scrolled to top. It seems that the left frame is reloaded and shown from the beginning. Is there any chance of getting the left frame to stay put and not reload/scroll to top? It would make mush more sense when navigating in along document if you don't loose the position each time you click a toc entry. And, since the toc is embedded into every html page, reloading will happen. "Some people complained that the frames didn't work in their browsers. We got complaints that it was hard to bookmark pages or to get links to send in e-mail. There were also complaints that the documentation looked very 1999." May be you should consider on filing a bug at docbook bug tracker just to make sure that this won't go un-noticed in the next release. which is an example of the phing-manual rendered with WebHelp. Just expand the menu (for example "Optional tasks" so it grows over the window height. Scroll down and then click on some section. The section will show correctly but the toc will be scrolled back to top which is nuance. 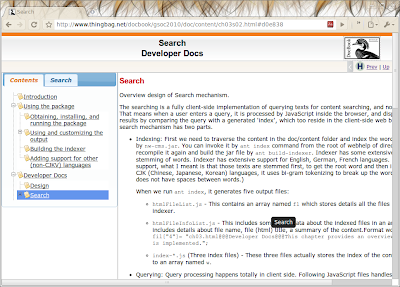 I have added this as issue "3490902" in SourceForge DocBook tracker. In the meanwhile, if you are interested in patching your code, you may use following scripts as appropriate. NOTE: In the next release, #leftnavigation should be replaced by #treeDiv. Add a onclick method for the links, and set a cookie for the value of . Then at main.js document.ready, do  with the relevant cookie value. I am using ant 1.8.2, jdk 1.6.0. In my Classpath I have: webhelpindexer.jar, lucene-analyzers-3.0.0.jar, lucene-core-3.0.0.jar, xercesImpl.jar, xml-apis.jar. And I am using the class com.nexwave.nquindexer.IndexerMain by using a java task for the implementation. I would really appreciate if you can help me on this because I spent a hell of time without a result! Can you tell me what version of DocBook XSLs you are using? Is it 1.76.1 or a snapshot? It's recommend to use latest snapshot if you are in development stage because a release is coming soon. And, well, 1.76.1 doesn't have com.nexwave.nquindexer.IndexerMain class. It's a new addition after that release. Just open up the the webhelpindexer.jar and see whether the class is there. 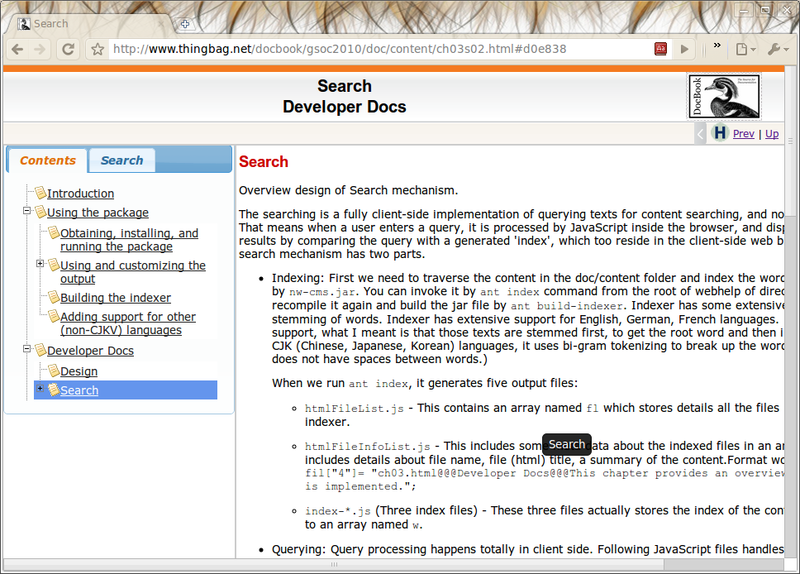 To make sure, are you compiling the webhelpindexer source, or just using the jar to generate the search contents? For a user, there's no need of compiling the source. Thank you a lot for the rapid answer. I am using 1.76.1 but added the java task instead of using the indexertask (it was also not working) and I am just using the jar file for webhelpindexer. Where can I have access to the latest snapshot and how to compile the webhelpindexer source or obtain a jar file containing the class com.nexwave.nquindexer.IndexerMain? You may simply replace the webhelpindexer.jar in 1.76.1 with extensions/webhelpindexer.jar in the extracted snapshot. And, you should carefully copy the relevant contents in build.xml file. I haven't tested this by myself. Let me know how it goes. Do you plan to incorporate following additional features as part of current or future plan? Has anyone implemented context-sensitive help with DocBook+WebHelp using a header / map file rather than hard-coded URLs? Or with some equivalent functionality that provides an intermediate step between the application and the help? Thanks for the link solution Robert. I want to modify the XSL so that it chunks at instead of . Does profiling for webhelp works with the 1.76.1 style sheets? Is xhtml/profile-chunk.xml the right template to start with? Can you point me to necessary steps in Maven and/or XSL customization setups to fix it? I tried to search the solution but nothing works for me (maybe I apply instructions for Ant incorrectly to Maven infrastructure). It took me 20 hours to render an entire project database (xml generated by a code crawler) and the end result blows me away (Please see http://red1.org/idempiere) TMany awesome kudos to you and your team and i am willing to stand as goodwill reference and ambassador to your wonderful work. (Feel free to quote me or point me to where i can post further reviews.) High ten!